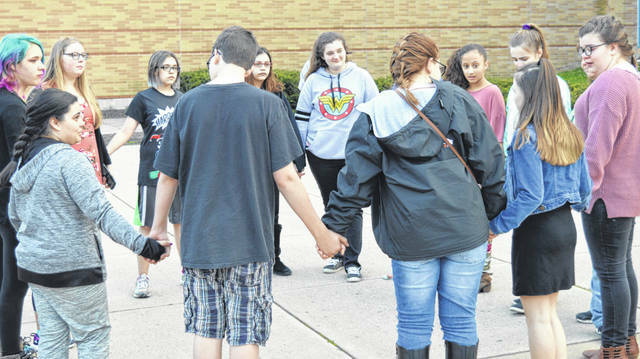 Classmates and others come together Wednesday evening outside the Wilmington Middle School at a prayer vigil for Alaina Quillin. For more photos, visit wnewsj.com. Vigil attendees watch and react as a Chinese sky lantern in memory of Alaina goes higher and higher. Classmates and friends formed a circle, with each taking turns to come up with one word to describe Alaina as well as telling a memory they have. WILMINGTON — Group hugs among her classmates were a frequent occurrence Wednesday at a vigil held on the Wilmington Middle School campus for Alaina Quillin, 14, who died Monday night. Her current language arts teacher, Tammy Sexton, described Quillin as a beautiful writer. “She was a very creative writer, [creative] thinker, really a deep reader. For language arts, she was the whole combination for me,” said Sexton. By “deep reading,” the eighth-grade English teacher meant Alaina would dig deep into the text and get the deeper meaning out of things. Sexton added that Alaina was really good with special needs kids. “We have a couple kids who are autistic and she would work with them and she always had so much patience with them, when other kids would get frustrated with them. She was the one that was calm, and wouldn’t give up on them, so some of our special needs kids are really feeling her loss, they’re trying to process that,” Sexton said. Jordan and Mackenzie Snarr knew Alaina from their neighborhood. Jordan recalls water balloon fights and Alaina being so helpful “with all the little ones,” and Mackenzie said Alaina was always a fun person to be around. Organized by two women, the school vigil included prayers, a moment of silence, a candle lighting by her mother Kerrie Fahey, attendees writing notes of encouragement on the board, a platter of chocolate chip cookies, a lantern, and spontaneous group hugs when an attendee was having a difficult time. Classmates and friends also formed a circle with each coming up with one word to describe Alaina and a memory. Family members spoke at the gathering. Alaina’s eldest brother said how much she meant to family and friends. He also talked about wanting to move forward and help others who are going through what Alaina went through, and how that effort will help him “get through this pain” and help his family, too. As previously reported, authorities report the death was a suicide. A grandmother said Alaina was allergic to cats and dogs and had a pet hamster. She loved to swim, pop popcorn and watch scary movies. At the conclusion of the outdoors vigil where birds chattered when attendees turned quiet, a Chinese sky lantern in memory of Alaina was lit and set afloat by the family to rise into the sky of the early spring evening. If you are in a crisis, thinking of harming yourself or others, and need immediate help, tell someone right away. Call 911 for Emergency Services. Call the Crisis Hotline at 1-877-695-6333. Go to the nearest hospital emergency room. — Mental Health Recovery Services of Warren & Clinton Counties. 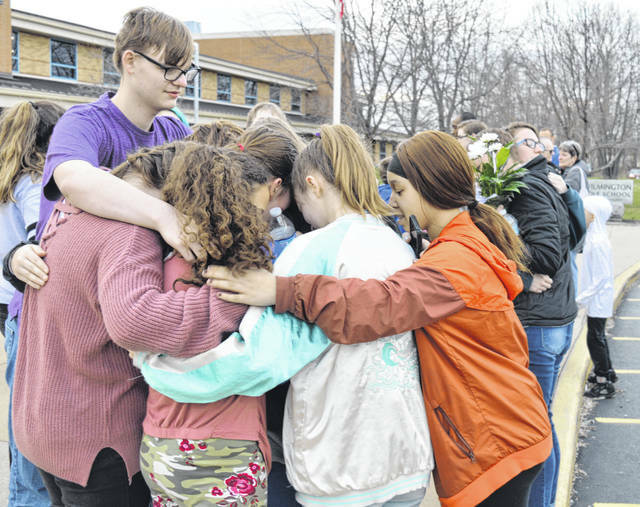 https://www.recordherald.com/wp-content/uploads/sites/27/2019/04/web1_group_hug.jpgClassmates and others come together Wednesday evening outside the Wilmington Middle School at a prayer vigil for Alaina Quillin. For more photos, visit wnewsj.com. 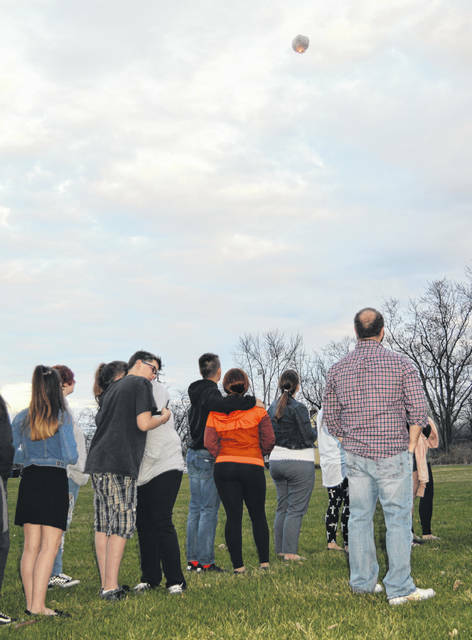 https://www.recordherald.com/wp-content/uploads/sites/27/2019/04/web1_lantern_people.jpgVigil attendees watch and react as a Chinese sky lantern in memory of Alaina goes higher and higher. https://www.recordherald.com/wp-content/uploads/sites/27/2019/04/web1_circle_classmates.jpgClassmates and friends formed a circle, with each taking turns to come up with one word to describe Alaina as well as telling a memory they have.